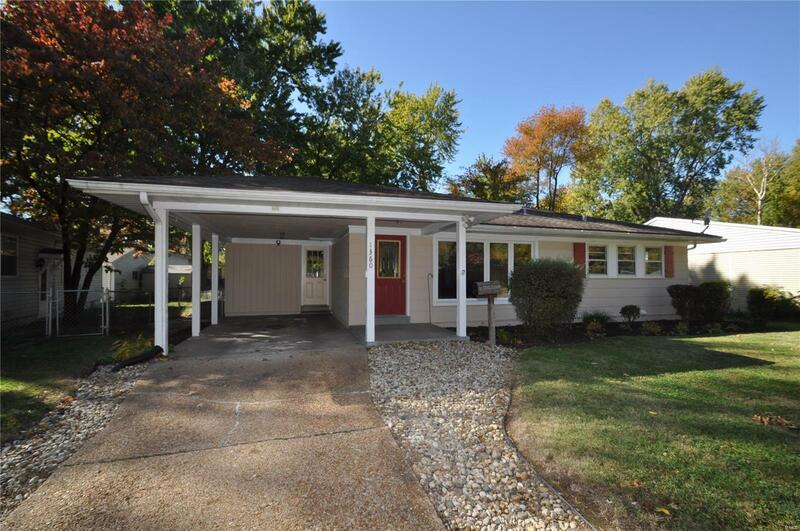 1360 Mundy Drive Florissant, MO. | MLS# 18093068 | Real Estate in Saint Charles and Saint Louis Areas, including Saint Charles, Saint Peters, Weldon Spring, O' Fallon, Wentzville, Dardenne Prairie, Creve Coeur, Chesterfield, Florissant, Hazelwood, Kirkwood, Des Peres, Saint Louis City, Homes for sale. NEW CARPET INSTALLED ON THE MAIN FLOOR!! Open floor plan ranch style home that is very unique. The 3rd bedroom on the main floor has been opened up to create a large open floor plan. Possible 3rd bedroom in lower level in addition to the finished recreation/family room and 2nd full bathroom!! Open kitchen with all appliances to stay. Main floor is comprised of large living room, open dining room flex space, kitchen and breakfast room, 2 bedrooms, and full bathroom. The finished lower level has a large family room, 3rd bedroom/office, and full bathroom. Awesome shaded level rear yard, fenced and large shed and patio. This home also has 1 car carport!! See this one today.